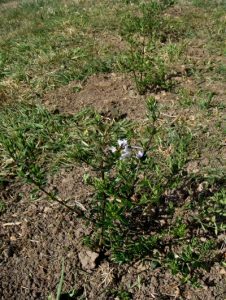 Westringia Glabra soon after planting. 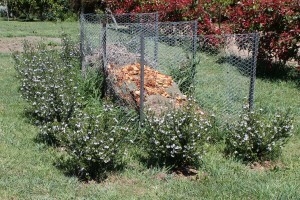 I’ve just planted ten Westringia Glabras which I am hoping will make a suitable hedge around the new compost area. 80cm apart seemed best. Almost all Westringias I’ve seen have been growing naturally in the shape of an upside down fish bowl, but I’ve read in several places (including Angus Stewart’s book) that they can be used as a formal hedge. We shall see. Westringia Glabra hedge in progress. Not really doing so much in the way of screening as yet, but I’m happy with how they are coming along. I gave them a bit of a tip prune in autumn, as per the nursery advice card. Other than that, they’ve been pretty much self-sufficient. They have welcomed the occasional watering by reacting in no way what-so-ever; I wouldn’t bother watering them at all, but the Waratahs have left me feeling guilty my lax watering regime. Provided they actually end up growing to the advertised 1.5 metres, thus fulfilling their function as a screen for the compost fencing, I will consider them a great success.